During her thirty years at the Bibliothèque Nationale (BN), Suzanne Briet (1894-1989) made important theoretical, organizational, and institutional contributions to the documentation movement in France. This paper attempts to place her documentation work within the context of the far-reaching reform of French libraries, with special attention to the transformation of the BN. Like her colleagues in special libraries, Briet embraced modernity and science. However, because of her strong orientation toward humanistic scholarship, she viewed documentation service and bibliographic orientation as an enhancement rather than a rejection of the scholarly traditions of the national library. This paper will focus on her efforts to integrate the innovative ideas of the documentation movement into the practice of librarianship at the Bibliothèque Nationale. Suzanne Briet appreciated the need to leave behind a memoir that would offer some record of what she was like as a person, a work that would express her thoughts and beliefs. Reflecting back on her long life, Briet wrote, "At the age of twenty, I had as my motto: 'To weep perhaps, but never to hate.' At forty it was: 'To serve.' At eighty it could be: 'To return to the Spirit' "(l'Esprit) (1976, p.30). These three mottoes succinctly express what she felt mattered most in her personal life and her career-a dedication to service and a deep commitment to humanistic values and to the Catholic faith. In 1976 when she was 82, Briet published Entre Aisne et Meuse et au-dela, a memoir that is most unusual in content and form. Abandoning ordinary narrative structure, Briet instead presents her recollections under key words alphabetically arranged. In her preface entitled "On Opening the Alphabet," she declares that she has no intention of writing an autobiography nor of providing documentation placed within a chronological framework. In fact, she completely dispenses with dates. It is with intentional irony that this woman who held a degree in history ( licence ) and who devoted her entire career to the rational organization of information, chose to present her own life "without any systematic order" (1976, p.30). At first glance Entre Aisne et Meuse looks like a reference work, made up of a sequence of records arranged in letter-by-letter alphabetization. However, Briet's choice of entry words is completely idiosyncratic: she includes proper names, places, an occasional proverb, and ordinary words (like house, hand, and light) that evoke deeply personal memories. Some close friends and family members are entered under their first names, other people are introduced in specific anecdotes, and some appear only as initials. Even though her choice of entries defies logic, Briet engages the reader with passages of pure poetry intermixed with prose that is often moving or profound; some entries recount ordinary events that left an impression on her, while other terms provide a spring-board for whimsy, biting wit, or humor. Believing that in old age "the past is more present when life is less pressing," Briet's goal is to evoke "some of the most extraordinary hours and the most significant human contacts." She concludes her preface by declaring "I would be happy if some readers catch sight of my gaze (mon regard) through the pointillism of this self-portrait" (1976, p.9-10). When citing this work, reference will be made to the keyword entry as well as the page number. Drawing on Suzanne Briet's highly original self-portrait as well as her professional publications, this paper will attempt to place her contributions into both a personal and an historical context. Born in 1894, Briet was part of a generation of young women who came of age in a nation struggling to confront enormous loss, significant social change, and new challenges left in the wake of the Great War. While she was never explicit as to why she chose the first motto, the goal "never to hate" probably reflects her experience of World War I. Born in Ardennes she grew up in Paris but remained very attached to the region where she and her sister Alice spent vacations with their extended family. Ardennes was also the pathway of German armies, and during the hostilities her uncle was deported, his village was invaded, and her grandfather's house was destroyed. Suzanne Briet was just 20 at the outbreak of the war, and recalls a close childhood friend who was killed, along with nearly 2/3 of his classmates (1976, KOLKHOSE MANQUE, p. 59. MAISON, p.. 71; MARCEL, pp.76-77). Despite these losses--or perhaps because of them--Suzanne Briet took an early interest in the League of Nations and sat in on some of the sessions held in Paris (1976, S.D.N. p.103). Briet's interest in international exchange seems to have developed at an early age; she recounts fond memories of her three trips to England--for vacations when she was 14 and 16, and then at 19 as a French teacher for the children of a Hindu princess (1976, INDE, pp. 52-53 , LONDRES, pp.65-66). Because her mother considered Suzanne destined to be a teacher, she was sent to the Ecole de Sèvres, an elite school for the training of women secondary school teachers; there she continued her study of English in addition to taking a degree in history. Briet taught for a few years, but makes little reference to this time in her life, other than recalling that in the classroom she felt like she had been "delivered up to the beasts" (see 1976, LIVREE AUX FAUVES, p.64). Although Briet does not explain why she chose to study for the national library examinations, she credits her success to Louis Barrau-Dihigo, a distinguished bibliogrpher-librarian at the Sorbonne, who gave a course in bibliography to students preparing for the certificate. Not only did he offer her special encouragement, but when Briet explained that she could only participate on Saturday, he changed the time of the course to accommodate her (1976, PARRAINS, p.90). When Suzanne Briet began her career at the Bibliothèque Nationale at the age of 30, she entered a field that would soon be reshaped by the convergence of two movements in France--the "modern library" movement and the emergence of documentation as a distinct profession with its own techniques, standards and training. It was also a time when the first generation of French women began to enter traditional professions that were in the process of being redefined by radically altered social and economic conditions. At the BN, Suzanne Briet was at the very beginning of a demographic shift--when women went from barely 10% of the professional staff in 1927 to over 50% by World War II (Maack, 1983, p.434). In her thirty year career, Briet also witnessed and participated in a series of reforms and innovations that would eventually transform the BN from an institution constrained by elitist traditions and an insufficient budget into a national library with a vital leadership role in France and beyond. During this time, technological innovation also played a significant role in Briet's career and in the nature of work at the Bibliothèque Nationale. In 1924, the year of her appointment, electricity was first installed in the 17 th century building on the rue de Richilieu. Under the entry "LUMIERE" (light), Briet wrote "I attended the birth of electricity at the BN ..During winter season, and under cloudy skies, all work was impossible in the reading rooms and offices after three in the afternoon. . . . It was an unforgettable spectacle to see the green lamps burst into flower on the tables" (1976, p. 66). While the advent of electricity signaled a new era, the changes in technology and facilities as well as services came gradually--and it was not until 1931 that stacks were wired, enabling the library to continue paging books for readers in the late afternoon (Cain, 1936, p.8). Modernization of the library was the first priority for Pierre-René Roland-Marcel, who became Administrator General of the BN in 1924. Although he had had no prior experience with libraries, he brought to the post considerable background in public administration as well as close ties with leading political figures. He immediately initiated legislative reforms that would put the library on a firmer financial basis, while at the same time extending its authority over several of the great research libraries of Paris. To accomplish his ambitious goals, Roland-Marcel needed to recruit personnel with a new vision that would revitalize a staff whose orientation was toward tradition and scholarship rather than modernization. Roland-Marcel was eager to hire Suzanne Briet when he learned that she had obtained first place on the national certification examination for librarians and came highly recommended by her professors. After interviewing her, Roland-Marcel wrote to the Minister of Public Instruction and Fine Arts in July 1924 and requested authorization to immediately hire Mlle Briet whom he believed would be a valuable member of the staff because she spoke English fluently as well as having practical knowledge and an outstanding intellect. Although Roland-Marcel agreed to wait for the passage of pending legislation on the BN before naming new staff, he went ahead with Briet's appointment "as an exceptional case"(Roland-Marcel, 1924). Briet's only direct reference to Roland-Marcel in her memoir concerns an incident early in her career when she was one of just three women on the professional staff. She notes that the Administrator General "did her the honor" of bringing to her attention a motion presented to him by delegates from an informal club (amicale) of male staff members who urged that the number of women librarians be limited. Their reason was that if a woman were promoted to a managerial position ( conservateur-adjoint ) she would have no authority over her male colleagues or subordinates. Roland-Marcel then "confided" to her that the attitude of these delegates was so displeasing to him, that he intended to take the opposite course of action (Briet, 1976, AMICALES, p. 14) During the six years he headed the library, Roland-Marcel did manage to appoint several other women professionals even though he had few salary lines available. While not all of the male librarians were hostile to the appointment of women, some, like E. G. Ledos who headed the cataloging department, acknowledged that there had been considerable skepticism and ambivalence about the growth of "the feminine element" on the professional staff. Ledos wrote in 1936: "Although the [library] career has been open to women abroad for a rather long time, in France one was barely accustomed to the idea, and there was no lack of apprehension as to what would result from this experience. By their intelligence, their industry and their conscientiousness, the first two women who were assigned to the General Catalog . . . dissipated all these fears and caused idle prejudices to be silenced"(p. 243). Although she was not employed in the cataloging section, Ledos also alluded to Suzanne Briet and praised her work (1936, pp. 247, 251). During the early years of her career, Briet must have been quite aware of the need to prove herself, and she much later acknowledged that for a long time she had regretted not having been born male, because she felt that women were "handicapped in social life" (1976, FEMMES, p.39). Barely over a year after her appointment at the BN, Suzanne Briet married Ferdinand Dupuy, a professor of liberal arts from Toulouse. The couple had no children, and like many other French professional women of this generation, she continued to work full-time after her marriage. In addition to her duties at the BN and her professional association activities, she also authored several studies related to the history of Paris as well as articles in the library press which were published under Briet, Dupuy or Dupuy-Briet. After eight years of marriage the couple divorced. Little is known of this part of her life, and Briet's memoir offers no mention of her husband, and no entry under marriage. However, under the word FEMMES (women) she recounts an incident toward the end of her career when the subject of women and work was brought up at a meeting of directors (chefs d'établissments). To the amazement of everyone, she declared, "The place of woman is at home. If the two wars had not killed millions of French men, women would not have had to enter into the competition" (1976, p.39). This attitude was typical of conservative upper middle class families of her parent's generation, but it is indeed a paradoxical statement when made by a woman who appears to have freely chosen to combine a demanding career with marriage. Colleagues and friends described Briet as a committed feminist and she herself indicates pride in her role as co-founder of the Paris Chapter of Zonta International, an organization established in 1919, as "a global service organization of executives in business and the professions working together, across political and social boundaries, to advance the status of women worldwide" (Zonta International http://www.zonta.org/site/PageServe ). When asked late in life whether she had suffered from discrimination as a woman, Suzanne Briet replied that although certain prejudices were "inevitable", she had personally benefited from the support of several of the most noted scholar librarians as well as that the Administrators-General under whom she served(Briet,1982). In her memoir she mocked those colleagues in the all-male club that met in a nearby café by calling them "the knights of coffee with cream" (chevaliers du café-crème), but she warmly remembered three scholarly mentors whom she called PARRAINS or godfathers(1976, "AMICALES," p.14, "PARRAINS", p.90). Working under their direction, she gained a deep respect for bibliographical scholarship. Later, when she prepared a public relations brochure, she referred to "the traditional grandeur of the Bibliothèque Nationale" and declared: "To neglect this heritage would without doubt threaten the intellectual primacy of France. It would be to fail in our duties toward what is best in us"(1928, p. 8). In one copy of this pamphlet there is a hand-written note, "To the scholar librarians, homage and friendship, 1928, S.B." Suzanne Briet clearly recognized and respected the multiple roles incumbent on the staff of a great national library. She wrote that it was the duty of librarians "to conserve, to catalog, to make [materials] accessible on the one hand; to orient and instruct on the other." Her ideal was that of librarians "working with researchers, not . . . on the other side of a barricade, but among them in a real spirit of collaboration" (1932a pp. 11,18). Although Briet began her work in the gifts and exchanges section, she started her career at a time when a new ethos of public service was being promoted by the Administrator-General. In his 1925 report to the Ministry, Roland-Marcel wrote that reforms taking place at the BN were the result of "close collaboration between the administration and the personnel." He continued, " In saving the time of the reader, in providing for each user all the research facilities possible, given our old materials, my collaborators are proving that they know how to balance the duties of their profession." In the conclusion of his report, Roland-Marcel asserted that the time was long past when the BN could be administered "like a mysterious and solitary monument" placed outside of the evolution of contemporary society. After acknowledging the importance of safeguarding the treasures of the past, he declared it had become "increasingly important that all collections of recent works should be made easily accessible to anyone authorized to use the library" (Roland-Marcel,1925, pp. 121, 124; emphasis mine). Although Roland-Marcel advocated public service as a means to increase the effectiveness, visibility, and political support of the BN, he realized that he would need to find outside financial support to carry his reforms at a time when both funding and staff were limited. He therefore reactivated the society of the friends of the national library and in 1926 he oversaw the creation an Office of Documentation that was placed under the auspices of the society. As Michael Buckland notes, "From about 1920 'documentation' was increasingly accepted as a general term to encompass bibliography, scholarly information services . records management, and archival work"(1997, p.804). This definition seems quite in keeping with the functions of the new Office of Documentation which was given two separate but related responsibilities:(1) to centralize requests for information sent to the Administrator-Generaland (2) to offer a fee-based service that would provide copies, photographs, translations, abstracts and bibliographies (Briet, 1929, p.1). Briet later commented that librarians at the BN, who were already "overburdened, could not effectively respond to written requests for information, because such work interrupted the normal flow of activity(Briet, 1929, p.1). Therefore in June 1928 she was given responsibility to bring together all such requests; she then assigned this work to the most qualified specialists at the library, or sent it on to the Office of Documentation if fee-based services were needed. She noted that she also had responsibility for overseeing and offering technical assistance to those working in the documentation service; once their work was completed, it was "recopied" on a typewriter and one copy was kept in dossiers at the BN, where a record was maintained of research already done, so that it would not have to be repeated if similar requests for information were received (Briet, 1929, p.1). She later stated: "The Office [of Documentation] is nonetheless dependent on the library. It is based on the existence of the Library, without which it could not function. In return, the Office gives to the library the work it has undertaken. The national library thus is enriched by a collection of documentary archives that can be consulted by the public in the same way as its other collections"(Briet, 1932b, p.3). As Briet was organizing this new service, she was greatly influenced by the recommendations made by library experts at the 1927 meetings in Paris sponsored by the Institute of Intellectual Co-operation (IIC) of the League of Nations. The resolutions recommended that (1) each national library establish a "national information center" where researchers could find out in which library or special collection the printed materials or documentation they needed would be located; (2) that the national information center be adequately funded and provided with card catalogues, printed bibliographies, biographical sources, union catalogues and directories of special collections throughout the country; (3) that these national centers be in close contact with one another in order to answer questions about resources within their home country and to centralize researchers' requests for information that would need to be answered abroad. As early as 1927 Roland-Marcel began to lay the groundwork for the establishment of such a center at the BN by assigning Briet the task of compiling a directory of special collections held by the major libraries of France. By 1928 this card catalogue not only contained information on specialized collections but also listed printed catalogues of French and foreign libraries; in addition it had a section that served as a bibliography of bibliographies and another that indexed the work done by the Office of Documentation. During the next two years Briet further developed plans for an Orientation Center (Centre d'Orientation) that would provide information to users in the library as well as answering written requests for information from researchers in France and abroad. Although Briet does not use the term "reference service", both she and Roland-Marcel were aware of the kind of information and referral services available in American libraries. The directors of the Paris Library School (set up and administered by the American Library Association, 1923-1929), were in regular contact with the Roland-Marcel and he was quite willing to allow their students to undertake a practicum at the BN. He also visited libraries in the United States and became a member of the Comité français de la Bibliothèque Moderne--a group organized in 1922 at the initiative of Americans involved with the establishment of model public libraries in Aisne (a region in north eastern France that had been devastated by the German invasion). These American philanthropists and librarians were joined by a number of French political leaders as well as "modernist" French librarians who had long been advocating the reform of public libraries (see Maack, 1983; Maack, 1986). Two of these public library pioneers were Henri Lemaître (1881-1946), who later assumed a key leadership role in the French documentation movement, and Eugène Morel (1869-1934), a librarian at the BN who was both an outspoken public library advocate and, after 1929, a key leader in the Bureau Bibliographique de France (BBF) (Fayet-Scribe, 2000, p. 64). The BBF was the French affiliate of the Institut International de Bibliography (IIB) founded in Belgium by Paul Otlet and Henri La Fontaine; since this international body was the central force in the international documentation movement, Morel at the BN provided yet another link to these new ideas. As Sylvie Fayet-Scribe demonstrates in her seminal book on the history of documentation in France, during the 1920s and 1930s there was a great deal of intellectual exchange and cross-fertilization of ideas among the advocates of "modern" librarianship and the leaders of the emerging documentation movement (Fayet-Scribe, 2000, pp.56- 74). Not only were a number of the most progressive library leaders active in the documentation movement, but articles concerning public librarianship and documentation also appeared together in journals that encompassed all aspects of what we might call "the information professions." Henri Lemaître who edited the scholarly Revue des Bibliothèques and its successor Archives et Bibliothèques (1935-1938) published some of Suzanne Briet's early work. Her articles on the modernization of information service at the BN also appeared in Re vue du Livre edited by Georgette de Grolier, a public librarian who studied at the American Library School in Paris. This journal served as the official organ of several different association engaged in library reform, bibliography and documentation; while some articles dealt with policy and others with techniques of organizing information, a central underlying theme was a focus on the user (Fayet-Scribe, 2000, pp. 59, 143). At the same time these " modernistes " were advocating public library reform, there was also growing attention to the needs of scientific researchers who had long complained that French university and research libraries neglected contemporary scientific literature. The new techniques of documentation (especially indexing and abstracting) were nonetheless being developed throughout France, in specialized government agencies, commercial firms engaged in research, and professional organizations. The field of chemistry was in the forefront, and one of the most active proponents of the new documentation techniques was Jean Gérard, who was in charge of the center for documentation at the Maison de Chimie (an organization that brought together both learned societies and representatives of the chemical industry). Jean Gérard and Suzanne Briet are credited with being the co-founders in 1931 of the Union Française des Organismes de Documentation (UFOD)-an organization described by Buckland as "the French analog of ASLIB" (Association of Special Libraries and Information Bureaux) which had been founded in the United Kingdom seven years earlier (1995,p.236). Like ASLIB, the membership of UFOD was initially limited to institutional members (i.e. the documentation centers of public and private sector organizations). In France these specialized documentation centers represented a wide range of fields, and although organizations engaged in scientific and technical research predominated, there were also agencies whose focus was on economics, commerce, education, and the humanities. While it was Suzanne Briet who represented the BN, Bruno Delmas notes that "the support of Julien Cain, Administrator-General of the Bibliothèque Nationale was decisive" for the fledgling organization (Delmas, 1993, p.186). Although Julien Cain had studied historical bibliography at the Sorbonne and art history at the Ecole du Louvre before turning to a career in public administration, his interests did not exclude science and technology. Throughout his years as Administrator-General(1930--1940 and 1945--1964), Julien Cain was closely involved with UFOD--initially as vice-president and later as president of honor. Fayet-Scribe suggests that Cain "had to constantly navigate (naviguer) between the librarians and documentalists" (2000, p. 179), a view supported by Thérèse Kleindienst, his assistant at the BN, who recalls that Cain declared his guiding principle was "to maintain a well-considered balance between two equally necessary points of view--the respect for the values of the past and the willingness to respond to the exigencies of the present" (1993, p.161). Cain's commitment to the needs of the present included support for Suzanne Briet's new approach to service, and it was she to whom he assigned responsibility to conduct a survey of French documentation centers and compile a directory of such organizations. This survey was carried out much in the spirit of recommendations of the 1932 meeting of the Committee of Library Experts called by the League of Nations Organization for Intellectual Co-operation; however, Gérard's report to the Committee on UFOD may have influenced them to call attention to the "urgent need of encouraging new connections between documentation centers in the same country " (Rayward,1983, p.201). By 1935 when Briet published the French directory ( Répertoire des centres de documentation en France ) she had been able to identify and describe the services of 73 centers; over forty of these organizations were members of UFOD (Delmas, 1992. p.186). While such directories can never be considered exhaustive, Briet's publication represented an important step toward the accomplishmentof UFOD's first goal-"to prepare an inventory of all organizations in France whose purpose was the production and distribution of documentation concerning all branches of human knowledge " (Fayet-Scribe, 2000, p.187; quote from UFOD's 1931 statutes emphasis mine). The breadth of UFOD's scope is also apparent in its officers; in addition to Jean Gérard, Julian Cain, and the secretary-general Armand Boutillier du Retail, librarian of the ministry of commerce, the first executive committee included the director of the national archives, the former president of the society of civil engineers, the director of the central office for acetylene, and director of the national office of meteorology. Although Suzanne Briet was not a member of the original executive board (all male), Bruno Delmas suggests that from the beginning she, Jean Gérard and Armand Boutillier du Retail were the leaders on whom the organization depended (Delmas, 1993, p.187). Briet later became secretary-general of UFOD, which placed her in a key position in the French world of documentation and made her the most visible woman in the field. At the time she was engaged in preparing the UFOD directory, Briet probably saw this work as a logical extension of the card file on special collections in French libraries that she had already compiled at the BN. By 1930 her Orientation Center was installed in a special room furnished with printed catalogues and selectedbibliographies as well as the card indexes mentioned above. However, because the space was inadequate, her work was hampered by lack of easy access to bibliographies, catalogues and other printed resources. At the request of Julien Cain, Briet began planning for expanded bibliographic and documentation services that would be possible when new quarters were completed, and in 1933 she was sent by the ministry on a special mission to Berlin where she studied the organization and the services of the Auskunftbureau at the Prussian State Library. Finally in 1934 Briet was able to move her orientation center into a facility that enabled her to create the kind of service that she had long envisioned to meet the needs both French and international researchers. The construction of the new quarters for the BN in Paris and in Versailles was part of an ambitious capital improvement plan undertaken in the 1930s through special government appropriations for public works (similar to the Works Progress Administration in the US). Julien Cain worked closely with the architect and was able to increase the space in 17 th century building by having a basement constructed that would accommodate a new Catalog and Bibliography Room (Salle des Catalogues et Bibliographies). Suzanne Briet described the room in glowing terms: "Columns and walls of polished marble, vast luminous surfaces of the tiled floor, dazzling lamps reflected on every side, austere bookcases of dark oak which . . .enhance even the most ordinary bindings, . . . all of this takes one's breath away when one has just left the ground floor with its Second Empire vaults, its bronze shafts, wavering light and faded frescos"(Briet, 1938, p.8; for a photograph that captures this image, see Kleindienst, 1993a. p.90). Suzanne Briet enthusiastically embraced the modern austerity and brightness of this new domain over which she was to preside for the next twenty years. However, she clearly felt that new services to readers and easy access to the bibliography collection were as innovative as the air conditioning and modern lighting. Because the monumental printed catalogue of the BN was not yet completed (by 1930 only the volumes up through Liell had been published), Briet knew that it would save the time of the readers if they had accurate bibliographic references in hand before consulting one of the several supplementary catalogues that could provide the call number for the book. 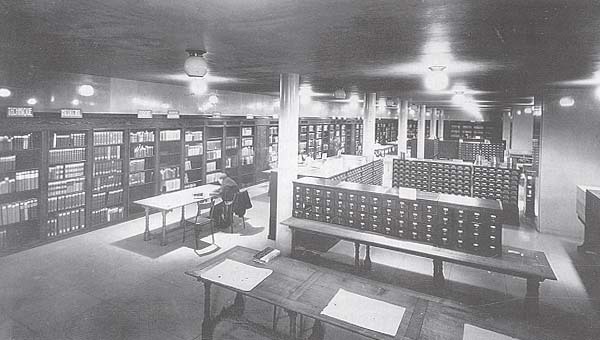 However, prior to the opening of the Catalog and Bibliography Room in 1934, many important bibliographies were arranged in a classification dating back to Louis XIV and were shelved on the third floor of the central stacks where only the librarians could consult them (1976, "Q, " p,95). When these works, along with other bibliographies from the main reading room, were installed in the new quarters, Briet remarked that it was as if the collection "like Sleeping Beauty, was awakened from a long sleep, and a new life commenced for it" (1934, p. 171). In 1936, after much resistance, the BN staff decided to adopt catalog cards in the international format, thus replacing supplementary catalogs in loose-leaf volumes which took up considerably less space. To accommodate this change, as well as make space for the growing number of printed reference works, a second extension of the basement was completed in 1938. 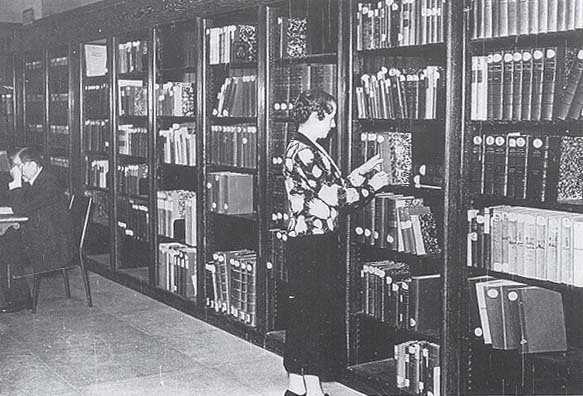 By 1940 the newly expanded Catalog and Bibliography Room contained nearly 7,000 volumes of bibliographies and 3,600 volumes of catalogs (Cain, 1947, p. 31). José Meyer, an American librarian working in Paris for the Library of Congress (LC) described this outstanding collection of "bibliographical material formerly dispersed in the various sections and stacks of the Bibliothèque Nationale" as being "unique in Europe" (1942, p. 811). In addition to making these retrospective bibliographies available, Briet's service also produced a card catalog known as the "central documentation index" (Meyer, 1942, p. 811). Arranged as a dictionary catalog, it contained cards for all the BN's exhibition catalogs as well as bibliographies of special collections; it also included information on other libraries and research centers in France--indicating whether they produced subject bibliographies or indexed current periodicals in their specialty. Since 1931 Briet's service had created listings of current bibliographies and later added indexing for 80 French and foreign journals on bibliography and librarianship. In addition to the central documentation index there were several card catalogs of the BN's own collections (supplementary author catalogs as well as subject catalogs and catalogs of anonymous works). And after considerable negotiation, the BN also received a depository set of catalog cards from the Library of Congress in Washington. These 1.5 million cards occupied 26 card catalogues arranged by LC classification numbers, with French translation for the major LC sub-divisions (Fayet-Scribe, 2000, p.30). Briet admitted that the humanities and history naturally occupied a privileged place in the Catalog and Bibliography Room, but she emphasized that science was no longer treated as a "poor relation"(1934, p. 171). After observing that the installation of electricity had made it possible to construct the new facility and the useof and the pneumatic tubes would soon allow for her service communicate with the other floors of the library--she ended her article by declaring that science and efficiency had come together in the modernization of the venerable library. However her vision of readers one day being able to use the documentation assembled by her service to "easily orient themselves in the immensity of literature from all times and all places" was not linked to technology, but to the new techniques being developed to organize information (1934, p. 173). In his report for the years 1935--1940, Julien Cain notes that after being installed in its enlarged quarters, Briet's expanded Center for Bibliographic Orientation was charged with (a) offering information on the collections and services of the BN; (b) orienting researchers toward the major collections in Paris and eventually, those in the provinces; (c) providing information on research institutes and documentation centers, and on the individuals most qualified to guide or to undertake a given kind of research; directing the reader toward specialized library collections; and participating in certain bibliographic publications (1947, p.122). Cain not only speaks at length about this work, but he devotes a whole chapter of this report to "the creation of diverse services of documentation." After declaring that "the Bibliothèque Nationale can not ignore the 'documentation movement' which is spreading throughout France," Cain then quotes the UFOD definition of a documentation center as a combined service where documentation, whether general or specialized, complete or partial, is systematically organized to be put at the disposition of users . It essentially calls for collaboration among (1) a service which brings together, registers, and classifies documents (archives, libraries, cinematheques, discotheques, museums,etc. ); (2) a service which indexes the documents and extracts from them all elements that are usable in the preparation of directories, of dossiers, of abstracts, etc. (3) a service that places the documentation at the disposal of the public, by means of information, communication, publication, reproduction, translation, etc." (1947, p. 121). Cain then highlighted Briet's work in preparing card files and printed indexes, directories and bibliographies as examples of documentation service at the BN; these publications included the Index Bibliographicus sponsored by IIC; a union list of foreign periodicals received by Parisian libraries; and a bibliography of exhibit catalogs. In addition to supporting UFOD and the projects undertaken by Briet, Julien Cain also served as president of a new body officially created by a ministerial decree in 1939-the Comité français de documentation; the other designated members included archivists and librarians as well as delegates from the French commission on intellectual co-operation and from the federation of scientific associations. In 1938, even before the new French documentation committee was officially sanctioned, it apparently replaced UFOD as the designated organization representing France at the International Federation of Documentation (abbreviated as FID--Fédération internationale de documentation) which that year had became the successor organization to the International Institute of Bibliography. While it is not certain what influence Cain had in designating the membership of the official French delegation to FID, it is clear that the documentation community in France included a broad range of disciplines and techniques, and was not solely focused on scientific information or on technological methods for the storage and retrieval of information. Although state-of-the-art equipment for microphotography had been acquired in 1937 at the BN, Cain expressed concern that the high cost of microfilm readers inhibited their widespread use in France. Nonetheless he concluded that the BN "has from the beginning resolutely placed itself in the center of research concerning microfilm and its applications"(1947, p127). Writing about the development of the Bibliothèque Nationale from 1930 to 1940, José Meyer states: "This period may best be characterized as one of far reaching material, technical, and intellectual change, the last determining the first as befits a scholarly institution"(1940, p.807). These years of renovation and innovation at the BN were dominated by Julien Cain, whose dynamic role in modernizing the library was brutally interrupted by the war and the German occupation. Cain, a Jewish intellectual, was dismissed from his duties in July 1940 by the Vichy government and the following February he was arrested by the Germans who eventually sent him to Buchenwald. One writer suggests that although absent, Julie Cain "was never more present," continuing to exert a moral and intellectual influence on those who resisted collaboration (Kühlmann, 1992, p.225). Some of Cain's initiatives were carried forward during the Occupation, and Bernard Faÿ, a professor at the Collège de France who was named Adminstrator-General by the Vichy government, proved to be supportive of work in the emerging field of documentation. However, Faÿ's approach was typical of "Vichy policy" characterized as "a melange of conservatism, obscurantism, and technocratic modernization" (Kühlmann, 1992, p.242). Later arrested for his anti-Masonic activities that lead to imprisonment or deportation of a number of French citizens, Faÿ was sentenced to forced labor in 1946. Certain BN staff who worked closely with Faÿ were subsequently arrested as collaborators; however, a few others were deported during the Occupation, and a small group of librarians who remained in Paris were later recognized for their work in the resistance(Chabrier, 1945). Although Suzanne Briet was not identified as part of the resistance network at the BN, she recounts an incident during the Occupation when she arrived at work one day to find that 22 staff members had been arrested as communists, including her secretary and her principal librarian. She then went to the Prefect of Police and offered guarantees of their innocence. Although they were released, it was not possible for her to get them reintegrated into the staff until after the liberation (Briet, 1976, MAINS (LES) PROPRES, p. 71). During the war years the BN was also allocated a number of temporary workers hired as "unemployed intellectuals" under a Vichy full employment program. About 30 of these individuals were assigned to Briet, and she put them to work filing cards in the Library of Congress depository catalog (1976. MAQUIS, p.75). However, in Faÿ's report for the years from 1940 to 1942, it is noted that three librarians were needed to supervise and guide these workers and to assist readers in Catalog and Bibliography Room. Those professionals needed to provide public service were expected to have a broad, general culture, to be trained in the use of reference materials and be well acquainted with the different services of the BN (Faÿ, 1944, p.354). Although the BN was cut off from receiving books and other materials from countries outside the Axis controlled areas, work continued on the central documentation index and on other similar projects, such as the augmentation of the card file listing printed catalogs from provincial libraries in France. In addition, a guide for readers was produced as well as a manual for documentary research, which was jointly published by the BN and UFOD. The 1940 to 1942 report concludes: "Nonetheless, despite various difficulties, the catalog and bibliography service has carried out the mission entrusted to it. In addition, in offering all of its varied clientele the possibility of working in an atmosphere marked by calm and careful labor, during this tragic period the service has been able to preserve a peaceful aspect which has been greatly appreciated"(Faÿ,1944, p.354). Although this section of the report is not signed by Briet, it seems likely that she in fact wrote it; a similar sentiment is echoed in her memoir under the keyword PAIX (peace) where she writes of the reading room with three hundred readers "peaceful with their books. Peace through books" (1976, p.87). In a climate of fear, censorship, oppression and physical hardship, the library seems to have provided a refuge where some semblance of normal life remained. It is also a tribute to library staff that the BN only closed for a mere fourteen days in June 1940 at the time of the German invasion, and again for ten days in August 1944 during the battle for liberation of Paris (Chabrier, 1945). After the war, when Briet prepared a short publication for UNESCO on damages suffered by libraries, she praised "the international solidarity of librarians"(1945, p.19). Briet remarked that in Paris, the German service for the protection of libraries (Bibliothekschutz), headed by Hugo Andres Krüss (whom she had met in Berlin when he was director of the Staatsbibliothek) protected libraries against abuses by the German military. In both Belgium and France the German library officials also assisted young librarians in avoiding deportation for forced labor. Briet credits this kind of aid among colleagues to the international meetings that had occurred between the two wars (1976. H.A.K., p.49; 1945. p.19). Briet herself had participated in numerous conferences in the 1920s and 1930s, and during the war she also attended a conference on documentation in Salzburg which was organized by German documentalists. As one of the delegates from France (along with Jean Gérard and Bernard Faÿ) Briet wrote a report in which she noted that German documentalists had adapted for their own use certain French methods developed by UFOD (Briet, 1943, p. 78). With the end of hostilities, organizations such as FID gradually began to resume their activities, and Suzanne Briet, as Secretary-General (1944) and later as vice-president(1948) of UFOD, again became very active in the international documentation movement. In her role as UFOD Secretary-General, Briet also helped to provide continuity for the organization during the difficult transition after the liberation. Accused of being a German collaborator, UFOD's founding president, Jean Gérard was sentenced to six months in prison (Richards, 1992, p. 300). Henri Lemaître, who was then elected president, worked with Frederick Joliot-Curie to insure that UFOD was placed under the charge of the Centre Nataional de la Recherche Scientifique (CNRS), the French scientific research organization that had launched an important scientific indexing and abstracting service during the war (Briet, 1951a, p.21). Following Lemaître's sudden death in 1946, the director of the French national archives became UFOD president. After CNRS ended its support, the organizational headquarters were eventually moved to the BN, where UFOD maintained a documentation center dealing with standardization, classification, intellectual co-operation and "documentologie." UFOD also resumed its publication program by issuing a series of manuals of documentary research in France. The return of Julien Cain to the BN in October 1945 also meant a resumption of documentation projects that had been started before the war as well as new initiatives. One of these concerned the preparation of a directory of French documentation services. In 1949 Cain assigned this task to Briet and her staff who carried out a survey that resulted in a listing of 309 documentation centers--a significant increase over her 1935 UFOD directory where only 73 centers were identified. Although scientific collections predominated, 22 of the French departmental or specialized archives had established documentation centers, and there were also documentation centers related to a wide range of humanities fields such as theater, prehistory, ancient Egypt, Catholic liturgy, and the arts ( Répertoire , 1951). This new directory, which was closely patterned on Briet's 1935 work, was published under the auspices of UNESCO and the French Direction of Library Services, a new agency responsible for the expansion and co-ordination of French public and university libraries. Within a year after his return to his post as Adminstrator-General of the BN, Julien Cain also became head of this new library directorate. Although a colleague noted that Cain "expressed his deep regret about the breach between libraries and documentation centers," public libraries also adopted some of the methods espoused by UFOD (Fayer-Scribe, 1998, p.190). During the post-war years, Julien Cain continued to work closely with UFOD, and although no longer on the active executive board, he was named one of its honorary presidents. Julien Cain was also supportive of UFOD's efforts to sponsor a training program for documentalists. Suzanne Briet had an important role in planning this part-time course which lasted for a two year period; the first year of instruction was offered by archivists, librarians, museum curators and heads of documentation centers. Most students were already working in documentation centers--a number were heads of the service, whereas others were charged with analyzing or indexing materials or carrying out more clerical functions. During the first year students from all levels were given a basic introduction to the "conservation, communication and production of documents as well as organization and management of centers of documentation" (Briet, 1947, p. 2). The second year courses were taught by specialists in various subject areas, and only those who already had university level degrees could enroll; each advanced student also wrote a lengthy research paper (mémoire), often on a subject that was closely related to his or her work. In December 1950 the training program pioneered by UFOD officially became a part of the Conservatoire Nationale des Arts et Metiers (CNAM) and Suzanne Briet was named the founding director of studies of this new documentation institute--l'Institut National des Techniques de la Documentation (INTD). The INTD attempted to address issues across a wide spectrum of the information professions, and its board included representatives from directorate of library services and the directorate of archives as well UFOD and CNRS (Renoult, 1992, p.437). Like the initial UFOD course, the INTD program also consisted of two years; the first year of instruction included a general introduction to selection, acquisitions, cataloging, classification, indexing, diffusion, exploitation, and reproduction of documents. The second year focused on research and on documentation in the specialized fields, including the social sciences and economics as well as science and technology. Briet did much to shape the curriculum, as well as teaching on a regular basis. In her memoir she expresses pride in being able to count among her former students a Benedictine, a head librarian, two university professors, a member of the Academy of Science, and a UNESCO expert (1976, ELEVES, p. 33). Suzanne Briet also had a great interest in professional education abroad and in 1950 she prepared an international survey of education for librarians and documentalists commissioned by UNESCO. The following year she was awarded a Fulbright grant to visit the United States (October 1951-February 1952). One of her goals was to study "professional education in some of the most important library schools, in order to eventually attempt to formulate international recommendations" (1953, p.300). In her published report, she concluded that American library schools did not yet ensure satisfactory training for special librarians" (1954, p. 340). What she meant by this is somewhat ambiguous, but it seems to reflect her insistence that documentalists must have subject expertise in the field or discipline in which they were employed as well as special training in documentary techniques. She went on to comment that most American professionals who worked in special libraries either had library degrees or graduate degrees in their specialty, but not both. Earlier, she had forcefully declared that "the documentalist should above all else be acquainted with the specialty which he supports professionally, and thus be able to bring together the bibliography, or better, the documentographie accumulated by the researchers themselves" (1951b. p.12). Documentographie , which has no English equivalent, is defined by Briet as "the enumeration and description of diverse kinds of documents"; examples she gives included descriptions of megalithic stones, of astronomical bodies or of ancient writings on stone(1951b, p.23). While Briet believed that library education programs in the US did not provide training in documentary techniques aimed at specialists capable of such work, she did acknowledge that in the areas of "the psychology of reading, the organization of libraries, public relations work, and services to children" American library schools were more developed than French training programs (1954, p. 338). She later observed that the library schools she visited covered "what one could call general documentation" (1954, p. 338). This statement would suggest that Briet equated "general documentation" not with information retrieval or documentary reproduction, but with a more generic introduction to the organization of information and to reference services. During her extensive journey across the United States-from New York to Los Angeles, from Boston to New Orleans-one of Briet's other goals was " to understand what is meant by 'reference work' in both general and specialized libraries"(1953, p.300). Before leaving she had been told that reference work in the US corresponded to what was called documentation in France. Briet admired the reference services that she saw in public libraries, and in her visits to university and special libraries she often noted whether the staff had library training, instead of, or in addition to, other professional qualifications or graduate degrees. The person with whom Briet had the greatest rapport was Ruth Vormelker, former president of the Special Libraries Association and the director of the Cleveland Public Library Business Information Bureau. Briet considered this library the highlight of her tour and especially noted that Vormelker had contacted leaders in business and industry to ask what kinds of services they would like the library to provide for them. Briet was equally impressed with Vormelker's collection of information resources which included: files on companies; newspaper clippings; information on business leaders; and collections of manufacturers catalogs and company reports (1953, p.304). Briet also commented on the use of microforms in some libraries, and referred early efforts to automate technical services. In addition, she examined state-of-the-art equipment in various settings, and even visited IBM in Manhattan where she saw a young mathematician calculating the position of the moon with a main frame computer that occupied a whole room. Nonetheless, Briet's focus was clearly on technique rather than technology, on reference services rather than information retrieval, and on users rather than equipment. Buckland suggests that Briet was one the few foreign visitors to recognize that "the vigor of the special libraries movement in the United States" made it somewhat analogous to the documentation movement in Europe. He continues: "This insight makes her trip reports interestingly different from the usual practice of making forced distinctions between documentation and librarianship" (Buckland, 1995, p. 236). Shortly before her trip, Briet had written: "The terms 'special librarian', 'library', and 'bibliography' have other connotations there [in Britain and the US] than in our country, where one makes use of the neologisms 'documentaliste', 'centre de documenation', 'documentographie'(1951b, p. 40). Briet apparently believed that the use of this new terminology represented a reconceptualization of information work and thus corresponded "to a stage development" in France that was "if not more highly evolved" than special librarianship in the English speaking world, was "at least more theoretically elaborated" (doctinalement plus élaboré) (1951b, p. 40). In her account of her visit to the US, Briet often highlighted examples of public libraries using the kind of techniques similar to those being developed by documentalists in France, and she remarked on specialized libraries or information centers that were in universities as well as those within government agencies and commercial establishments. She wrote: "I visited a large number of special libraries and also documentation services that were not called libraries"(1953, p.302). Briet's trip occurred during an important transitional period in the United States when the terms "special librarianship" and "documentation" may have been used synonymously on occasion; however, leaders engaged in the American Documention Institute were already beginning to focus on technological solutions such as microform and, later, on document-based information systems (see Rayward,1985, pp. 125). At the end of her tour, Briet observed that because American public libraries were relatively recent in origin, they were not overwhelmed by the "burden of immense collections of the past" but could instead engage in reference work, "giving their readers the information that they need, but which they do not have the . . . means to find themselves." Therefore, in the United States it was "natural" to use the term "libraries" for analogous services in commercial or industrial settings. She then remarked that in France the term "documentation center" was used for such collections and services, because "we feel much more keenly than the Americans the need for a new type of cultural institution, . . . more dynamic and better adapted to the present needs and more removed from the past" (1954, p. 339). As Briet was well aware, the work of documentalists in France closely paralleled that of special librarians in the United States. However, the approach of French documentalists differed significantly from that of their American counterparts, who were able to adapt existing practices (such as reference service, periodical indexing, newspaper clippings files) which had been developed much earlier by public and academic library leaders. In contrast, the French documentation movement occurred simultaneously with the reform of the Bibliothèque Nationale and the great French research libraries and was also closely linked with the concurrent movement to reconceptualize and modernize public libraries ( see Maack, 1993 and Fayet-Scribe, 2000). Like the "modernist" public library leaders who sought to replace the word "bibliothèque" by the phrase "la lecture publique" (literally translated public reading), Briet and her colleagues preferred the term "centre de documentation" over "bibliothèque specialisée". Although Briet appreciated the important role that both municipal and national libraries had in conserving the rich heritage of France, she criticized library methods as lacking flexibility and believed that existing book classification systems were too rigid (1951b, p.41). In contrast, she declared that documentation constituted a dynamic new approach characterized by an emphasis on information rather than on books and a focus on teamwork involving close collaboration between the documentalist and the users. In addition, Briet stressed that documentalists must engage in the production of "secondary documents" using a variety of "intellectual techniques" (including enumeration, description, abstracting, indexing, analysis, and synthesis, as well as a reproduction of primary documents). Examples of such "secondary documents" included card files, catalogs, vertical files, photographs, encyclopedias, and guidebooks. For Briet the creation of these secondary documents, customized to meet the needs of an individual user or a group of users, was "at the heart" of documentation (1951b, p. 24-25). Briet began her 1953 article on her visit to the United States by asking whether "one can speak of documentary methods in a country where the word 'documentation' is seldom used" and concluded by declaring that her American trip had confirmed that "there are no boundaries between librarianship and documentation, no more than those with other related activities, such as archival administration and museography." In the end, she viewed all of these fields as "distinct professions with common problems"(1953, pp. 299, 308). Although each field differed in regard to the predominant form of materials that were dealt with (books, reports, manuscripts, objects, photographs) as well as the institutional setting, Briet believed that archivists, librarians, museum curators and documentatlists were all engaged the work of documentation since their common goal was to provide information for others (1951b, pp. 9, 15). Because Briet used the term "documentalist" (celui qui documente autrui) to encompass all four fields, her meaning can best be rendered into contemporary English by the generic term "information professional". In a somewhat paradoxical manner, Briet suggests that while documentation as a PROFESSION had emerged from related fields such as librarianship (which she called a "pre-documentalist profession"), as an INTELLECTUAL DOMAIN, the field of documentation in France had come to embrace the core knowledge and techniques underlying all the information professions. This intellectual domain that Briet mapped out for documentation in 1951 is similar to definitions of the discipline of information science that became widely adopted in the English speaking world almost two decades later. The 1950s in many ways marked the height of Suzanne Briet's career, and on October 25, 1950 Julien Cain presented her with the cross of the Legion of Honor in the Catalog and Bibliography room over which she had presided for so many years. Much later she fondly recalled the event: "I was surrounded by family, friends and colleagues. I was overwhelmed with flowers, and everyone called me 'Madame Documentation'"(1976, LEGION D'HONNEUR, p.62). Briet's work was respected not only in France but internationally, where she was active in FID and IFLA as well as working on projects for UNESCO. Along with her teaching at INTD and her many projects and association activities, she also continued to supervise the services of the Catalog and Bibliography Room at the BN. In addition Julien Cain gave her the responsibility for organizing an exhibit at the Bibliothèque Nationale to celebrate the centenary of Arthur Rimbaud, (1854-1891) a brilliant poet from Ardennes who was related to Briet's family. She recalled later that after reading her first studies on the poet, Cain had remarked, "You are going to give a new face to Rimbaud"(1976, RIMBAUD, p.101). The centenary exhibit was one of Briet's last undertakings at the BN and marked a transition to the next stage of her life. In 1954 Suzanne Briet took early retirement at the age of 60, and although colleagues suggest that she left discouraged by a general resistance to new ideas, in her memoir she expresses quiet pride in her accomplishments, but no bitterness over the struggles in which she had engaged during the course of her innovative career (Lemaître and Roux-Fouillet, 1989, p.55; Briet, 1976). Whatever her feelings, Briet left Paris and moved to Mont-de-Jeux, located between Ardennes and Argonne. From that time on, she no longer published on documentation, but instead devoted herself to historical writings on Ardennes and as well as continuing her literary studies of Arthur Rimbaud. Never one to be idle, she authored over twenty publications related to Rimbaud as well as dozens of historical articles on other topics (Titres et Travaux, 1979). Briet also reactivated the Society of the Friends of Rimbaud and became editor of a journal devoted to the poet. Twelve years after her retirement, Suzanne Briet returned to the Paris area to be with her widowed elder sister; she died in Boulogne in 1989, at the age of 95. Briet left behind a complex legacy that has not yet been fully assessed. In her entry "LEGION D'HONNEUR" Briet briefly describes the three accomplishments that had earned her this high honor: the first was her role as one of the founders of the French documentation association; the second, her work in creating a training program for documentalists; and the third, her success in organizing a bibliographic orientation service at the BN. It was this last achievement of which she seemed most proud. She recalled: "I had been authorized to open, on an experimental basis (a titre d'essai), an Information and Bibliographic Orientation Service which would become an indispensable institution within the Catalog and Bibliography Room. I had furnished the great library [la grande Maison] with a service that was taken as a model throughout the world"(1976, p.62). This work has indeed been a lasting legacy; not only did Briet transform the concept of reference and bibliographic service in a national library, she created a highly acclaimed facility that continued to serve French and foreign researchers long after her retirement. When the BN moved to its new buildings, a room dedicated to bibliographic research and reference service (Salle X) was created as an "heir" to the Catalog and Bibliography Room that Briet had established (Département de recherche bibliographique http://www.bnf.fr/pages/zNavigat/frame/collections.htm accessed 12/17/03). While the impact of Suzanne Briet's work extended in time and space beyond the confines of the rue de Richilieu where she spent her career, it was her position at the Bibliothèque Nationale that enabled her to play a unique role in France and abroad. Despite the acute problems facing the BN at the beginning of her career, the prestige and the authority of the national library in a highly centralized country put Briet at the very center of French librarianship at time of critical transformation. As a woman in a male enclave, and as a student of modern languages on a staff steeped in Latin paleography, Briet was an outsider who had a strong respect for scholarly traditions, but was not wedded to practices and procedures of the past. Briet's role as an opinion leader was partly due to her ability to act as an intermediary between the different world views of the humanities, which she characterized as conservative, looking toward the past, and the sciences which she saw as revolutionary and future oriented. She wrote in 1951, "The evolution of human knowledge is an ongoing compromise between these two intellectual attitudes. Invention and interpretation, reflection and the testing of hypotheses share the intellectual landscape. Documentation is their servant"(1951b, p.10). While she acknowledged the importance of meticulous research for the printed catalogs of the BN, she urged that more flexible methods also be employed to meet the needs of users. These included directories, card catalogs, translations, photographs, and copies, as well as information given verbally or by correspondence (1932, p. 7). Service to users is a central theme of Briet's writings, and in 1932, at the time she was first developing the bibliographic orientation center at the BN, she wrote that at the "new Bibliothéque Nationale" the responsibility of librarians "to orient and instruct readers" demanded an innovative kind of service that was "attentive to the needs of the public, aware the resources available to meet their needs, and accessible to everyone." While such a service would centralize bibliographic information, it would also provide a means of referring users to specialized collections located elsewhere. She ended this article declaring that librarian should be "the friend of the reader"(1932a, pp.19, 20). Nearly 20 years later, when describing the social role of the documentalist, she wrote in a similar vein: "Altruism, team spirit, leadership ability, understanding of the user's psychology, facility in adapting to the needs of a group, or to the needs of an individual researcher, a social sensibility, affability, a service orientation, eagerness in carrying out research, all are manifestations of the outgoing behavior of the documentalist"(1951b, p.44). Briet would not have been able to implement her new approach to user-centered documentation service at the BN without exceptional administrative support, first from Roland-Marcel and then from Julien Cain. Both leaders offered her challenging assignments, but it was Julien Cain who was able to procure adequate support and facilities that made possible the kind of innovative services advocated by Briet. In a tribute to Julien Cain, a colleague wrote that the Administrator-General had a clear view of the problems to resolve, as well as tenacity, leadership ability and the confidence of the administrative authorities (Josserand, p. 64). Much the same could be said of Briet, who was also endowed with tenacity and a facility for problem solving as well as the ability to inspire others to join together in the emerging documentation movement. And she had found herself in the right place at the right time, working with administrators who shared her vision, provided material support, and challenged her to achieve her goals. In addition to establishing new bibliographic and reference services at the BN, Suzanne Briet's other institutional legacy was the creation of a training program for documentalistes at a time when there was no government sponsored educational program for librarians in France--other than the diploma from the famous Ecole des Chartes, whose focus was on archives and historical research. With support from Louis Ragey, head of the Conservatoire Nationale des Arts et Metiers, the documentation courses that Briet and her UFOD colleagues had begun as an unofficial, experimental program became the Institut National de Techniques de la Documentation. Buckland calls this program one of the first schools of Documentation / Information Science anywhere in the world (1995). From 1951 until 1954 when Briet was Director of Studies approximately 15 students graduated annually from the two year program (Renoult, 1992, p.439). Fifty years after her retirement, INTD remains one of Briet's most vital legacies; still located at CNAM the institute now enrolls 500 students in its various documentation courses. (Les activités de l'INTD http://www.cnam.fr/instituts/INTD/activités.html , accessed 12/14/03). Suzanne Briet's other important legacy is her impressive list of historical, literary and professional publications. Her contributions to library literature were multifaceted, and include: directories and bibliographies; articles on her work at the BN; reports on the work of UFOD and on international conferences; and discussions on the nature of documentation and education for documentalists. While many of her publications are of considerable historical interest, it is her 1951 manifesto, Qu'est-ce que la documentation? that has captured the interest of contemporary writers such as Ron Day, who refers to it as "extremely important book" (2001, p.21). As Day suggests, in the post-modern era when the cultural determinants of science have come to the fore, many of Briet's ideas take on new relevance. And in an era increasingly dominated by access to digital resources and hypertext, a new awareness of the common problems shared by archivists, museum curators, librarians and information scientists has also sparked renewed interest in Briet's theoretical work. She wrote in 1951: "It is not unusual that the documentalist finds himself at the head of an establishment that includes a specialized library, a research section, an indexing/abstracting service, a photo-microfilm service, an exhibition hall, a clippings file . . . Archivist, librarian, museum curator, our documentalist is all of these at the same time. It is therefore necessary that, in addition to his original subject specialization, he have some insight into the methods of the other professions to which he is in fact related"(1951b, p.20). Paradoxically, although Briet strongly advocated subject specialization for documentalists, she also saw their work as a part of a "new humanism." By this she meant that the documentalist should offer "a corrective to specialization" by guiding researchers with narrowly focused expertise to works that were "on the frontiers" of their domain of knowledge(1951b, p. 14). As such, the documentalist had a generative intellectual and cultural role to play in the creation of new knowledge. Ron Day also calls attention to the fact that for Otlet, Briet and their colleagues writing in the 1920s and 1930s, "documentation quite obviously was a cultural event that had definite political goals and effects, including shaping the future--and the possibility for the future-in a particular way" (2001, p. 35). Both in terms of their theoretical approach and their political agenda, the leaders of documentation movement in France had goals very different from those of the International Bibliographic Institute that Otlet and Fontaine had launched in Belgium in 1895. Many French documentalists, like their library colleagues, openly opposed the idea of a centralized Universal Bibliographic Repertory which they viewed as grandiose and impracticable; these opponents included Barrau-Dihigo, Briet's mentor, as well as Gérard (Rayward, 1975, pp.290-291, 357-58). In her 1951 manifesto Briet stated that "documentation will lose nothing by unburdening itself of the Universal Bibliographic Repertory that the whole universe has treated as a chimera"; instead, she advocated the development in France of a decentralized but coordinated network of documentation centers--each providing customized indexing and abstracting services as well as developing collections of diverse kinds of documents relevant to the needs of their users (1951b, p.9). For the organization of materials in these documentation centers, Briet rejected the use of "encyclopedic classificiation schemes" such as the Universal Decimal Classification (UDC), but instead proposed that the documentalist should "construct from scratch a specialized classification that takes account of the major and subsidiary interests" of the users of the documentation center--whether these users were scholars, scientists, or researchers in commercial or industrial establishments (1951b, p.24). Michael Buckland calls Briet's 1951 work "a remarkable manifesto on the nature of Documentation" and declares that although "this tract may seem at first to be enthusiastic hyperbole, . . . Part I remains significant because it is still a challenge to orthodox views concerning the scope of information science"(1995, p.235). At the beginning of her manifesto, Briet defines a document as "evidence in support of a fact." She further develops this idea by describing a document as "any physical or symbolic sign, preserved and recorded to demonstrate a physical or conceptual phenomenon"(1951, p. 7; Buckland, 1998, p. 217). Buckland notes that Briet's approach is "reminiscent of discussions of how an image is made art by framing it as art." After acknowledging that "Briet's rules for determining when an object has become a document are not made clear," Buckland goes on to infer from her discussion that a document must exhibit: (1) Materiality: physical objects and physical signs only; (2) Intentionality: i. e. it is created to serve as evidence; (3) The object must be processed; (4) The object must be perceived to be a document (the phenomenological stance) (1998, p. 217). Since Briet dedicates Part I of her manifesto to Julien Cain, it is possible that he had some influence on her ideas; in any case, her experience at the BN shaped her conception of documents as being objects as well as texts. In addition to departments for Manuscripts and Printed Books, the BN had an important Department of Medals that collected coins and other objects, and a Department of Prints and Engravings that collected visual images. Briet states: "Because of the presence of sculptures, medals, geographical maps, and personal souvenirs in a library one should henceforth be required to use the term 'documentographie'" in place of bibliography (p.20). Although it was a leap of the imagination to extend the idea of a "document" from a coin in an exhibit case to an antelope in a zoo, in both cases the principles of identifying, collecting, classifying and juxtaposing could be employed to enable users to access information from animate or inanimate objects. Briet's final legacy was her memoir, Entre Aisne et Meuse . Like her efforts to define documentation, this work also leaves the reader with many unanswered questions, ambiguous references, and unexplained omissions, as well as challenges to any preconceived ideas about her. Briet's eloquent if unconventional memoir nonetheless offers flashes of insight into the turbulent period in which she lived as well illuminating her close relationship with her mother and sister, her courage under duress during the German Occupation, and her sense of humor as well as her gift of poetry. Although she has left us with a self-portrait that both reveals and conceals her gaze, she has not only offered a glimpse of what happened but also a sense of "what the person was like to whom it happened" (Woolf, 1985, p. 65). The translation would be: Between the Aisne and the Meuse and Beyond. These were two rivers that bounded the part of the Ardennes that was her ancestral home. Suzanne Briet was a reader of Virgina Woolf; although she could not have seen the memoir where Woolf attempts to define "moments of being" Briet came close to this idea when speaks of "quelques des heures les plus extaordinaires." Briet does not quote directly from Otlet or Morel, but much of her writing does bear the imprint of their ideas. Information on indexing services was very important in France where there were no commercial indexing services such as those the H. W. Wilson company provided in the US. Cain had also been associated with the Socialist popular front government, and was a friend of the former premier, Léon Blum. It is not clear how extensively Briet read American library publications; in her publications she refers to several American authors (such as Jesse Shera, Luther Evans, Periam Danton) but seldom quotes from them directly. Bibliothèque Nationale de France. Département de recherche bibliographique http://www.bnf.fr/pages/zNavigat/frame/collections.htm accessed 12/17/03). Briet, S. (1928). La Bibliothèque Nationale . Paris, Bibliothèque Nationale. Briet, S. (1929). Le centre français d'orientation. Resumé de la communication présentée au Congrès des Biblioèques, Rome, 1929. mimeographed. Record group 1929. Achives of the Association des Bibliothécaires Français, Paris, France. Briet, S. (1932a). L'activité bibliographique et documentaire à la Bibliothèque Nationale . Revue des bibliothèque s, 42: 7-19. Briet, S. (1932b). Le centre français d'orientation. [off-print; no publisher given]. Suzanne Briet, Dossier de Personnel, Archives de la Bibliothèque Nationale, Paris, France. Briet, S. (1934). La nouvelle salle des catalogues à la Bibliothèque Nationale . Revue du livre, 2 (7), 170-178. Briet, S. (1938). La nouvelle salle des catalogues à la Bibliothèque Nationale. Bulletin du bibliophile et bibliothécaire (Octobre), 437-442. Briet, S. (1945). Bibliothèques en détresse. Paris:UNESCO. Briet, S. (1947). Enseign ement de la documentation en France . [off-print; no publisher given]. Suzanne Briet, Dossier de Personnel, Archives de la Bibliothèque Nationale, Paris, France. Briet, S. (1951a). La documentation en France de 1945 à 1950. A.B.C.D. Archives Bibliothèques, Collections, Documentation (no. 13) 337-340. Briet, S. (1951b). Qu'est-ce que la documentation? Paris: EDIT, 1951. Briet, S. (1953). Bibliothèques et centres de documentation technique aus Etats-Unis. Notes d'un voyage de quatre mois (Octobre 1951--Février 1952). A.B.C.D Archives, Bibliothèques, Collections, Documentation (no. 11) 299-308. Briet, S. (1954). La formation professionelle des bibliothécaires aus Etats-Unis. A.B.C.D. Archives Bibliothèques Collections Documentation (no. 13) 337-340. Briet, S. (1976). Entre Aisne et Meuse...et au delà. Charleville-Mezières: Société de Ecrivains Ardennais. Les cahiers ardennais 22. Briet, S. (1982). Interview with Mary Niles Maack and Renée Lemaître, September 3. Buckland, M. (1995). The centenary of "Madame Documentation": Suzanne Briet, 1894-1989. Journal of the American Society for Information Science , 46(3), 235-237; (draft) http://www.sims.berkeley.edu/~buckland/brietjas.html. Buckland, M. (1998). What is a "document"? In M. Buckland & T.B. Hahn, (Eds.) Historicial studies in information science . ASIS Monograph Service. (pp.215-220). Medford, NJ. : Information Today. (reprinted from 1997 Journal of the American Society of Information Science 48, (no. 9 Sept), 804-809. Cain, J. (1936). Les transformations de la Bibliothèque Nationale et le Dépot annexe de Versailles . Paris: Editions des bibliothèques nationales. Cain, J. (1947). Rapport sur le foctionnement des divers services de la Bibliothèque Nationale pendant les années 1935 à 1940. Paris: Bibliothèques Nationale..[the report was prepared in 1940 but was not published until 1947]. Chabrier, M. (1945) La Bibliothèque Nationale 1940-4. Journal of Documentation, 1(3),136-150). Delmas, B. (1992). Une fonction nouvelle: Genèse et développement des centres de documentation In. In M. Poulain (Ed. ), Histoire des bibliothèques françaises.[Vol. 4.] Les bibliothèques au XXe siècle.1914-1990 .(178-193). Paris: Promodis--Editions du cercle de la librairie. Day, Ron (2001). The modern invention of information: Discourse, history, and power. Carbondale, IL: Southern Illinois University Press. Delmas, B. (1993). L'INTD et son rôle dans la formation des documentalistes en France 1932-1993. Documentaliste 30(4/5), 218-226. Faÿ, B. (1944 ) . Rapport sur la Bibliothèque Nationale présenté au Maréchal de France, Chef de l'Etat. Paris: Bibliothèque Nationale. Fayet-Scribe, S. (1998). The cross-fertilization of the U. S. public library movement and the French documentation model (IIB, French Correspondent of FID) through the French professional associations between World War I and World War II. In M. Buckland & T.B. Hahn,(Eds.) Historical studies in information science . ASIS Monograph Serive. (pp.181-192) Medford, NJ :Information Today. Fayet-Scribe, S. (2000). Histoire de la documentation en France. Culture, science et technologie de l'information 1895-1937 . Paris: CNRS Editions. L'Institut national des techniques de la documentation, Conservatoire national des arts et métiers. Les activités de l'INTD. http://www.cnam.fr/instituts/INTD/activités.html. Josserand, P. (1966) L'oeuvre de Jullien Cain au département des imprimés . Gazette des beaux-arts (July), 60-64. Kleindienst, T. (1992). Les transformations de la Bibliothèque nationale. In M. Poulain (Ed. ), Histoire des bibliothèques françaises.[Vol. 4.] Les bibliothèques au XXe siècle. 1914-1990.(85-104). Paris: Promodis--Editions du cercle de la librairie. Kleindienst, T. (1993) Cain, Julien (1887-1974 ). World Encyclopedia of Library and Information Science . 3 rd ed. Chicago: American Library Association. Kühlmann, M. (1992). Les bibliothèque dans la tourmente. In M. Poulain (Ed. ), Histoire des bibliothèques françaises.[Vol. 4.] Les bibliothèques au XXe siècle. 1914-1990. (85-104). Paris: Promodis--Editions du cercle de la librairie. Ledos, E. G. (1936). Histoire des catalogues des livres imprimés de la Bibliothèque Nationale . Paris: Editions des bibliothèques nationales. Lemaître, R. & Roux-Fouillet, P. (1989). Suzanne Briet (1894-1989). Bulletin d'Informations del'Association des bibliothecaires Français , (no. 144),55-56. Maack, M. N. (1983). Women librarians in France: The first generation. Journal of Library History . 18 (4), 407-449. Maack, M. N. (1993). "l'Heure Joyeuse, the First Children's Library in France: Its Contribution to a New Paradigm for Public Libraries." Library Quarterly 63:257 - 281 (July). Meyer, J. (1942). The Bibliothèque Nationale during the last decade: Fundamental changes and constructive achievement. Library Quarterly 12(4), 805-825. Rayward, W. B. (1975). The universe of information: The work of Paul Otlet for documentation and International organization. Moscow: FID 520. Rayward, W. B. (1983). The International Exposition and The World Documentation Congress, Paris, 1937," The Library Quarterly 53 (July 1983):254-268. Rayward, W. B. (1985). Library and information science: An historical perspective. Journal of library history, 20 (1):120-136). Renoult, D. (1992). Les formations et les métiers. In M. Poulain (Ed. ), Histoire des bibliothèques françaises.[Vol. 4.] Les bibliothèques au XXe siècle. 1914-1990 .(85-104). Paris: Promodis--Editions du cercle de la librairie. Roland-Marcel, P. (1924) Letter to the Ministre de l'Instruction Publique et des Beaux-Arts, July 12. Suzanne Briet, Dossier de Personnel, Archives de la Bibliothèque Nationale, Paris, France. Roland-Marcel, P. (1925) Bibliothèque Nationale. Rapport sur le fonctionnement de ses services. Bulletin de l'Association des bibliothécaires français (July-December 1925), 112-127. Répertoire des bibliothèques de France: Centres et services de documentation . (1951) Paris: Bibliothèque Nationale. Richards, P. S. (1992). Scientific information in occupied France, 1940-44. Library Quarterly 62(3), 295-305. Woolf, Virginia (1985). Moments of Being . New York: Harcourt Brace & Co.